BEN WATTENBERG: Over the course of the century, American women had been gradually moving into the workforce. At the height of World War II, Norman Rockwell captured the spirit of America's working women with this robust take on an American icon, Rosie the Riveter. After the war, Rosie the Riveter, Sally the Secretary and many others went back home. But soon women would return to work in larger numbers than ever before, and America would never be the same. ALICE KESSLER-HARRIS: I think the war-time experience had an impact on women. It raised expectations of what life could be like. It made it possible for them to imagine dual roles both inside the home and outside the home. It made it possible for them to imagine the kind of economic independence that was less possible before the war. BEN WATTENBERG: Most middle-class women in the 1950s and early 1960s were living comfortable lives, certainly by most any previous measurable standards, certainly in America's thriving suburbs. But not everyone was fully satisfied with this leafy suburban utopia. One housewife tapped into the unease about what she called "the problem that has no name." Betty Friedan was born in Peoria, Illinois in 1921 and attended Smith College. Friedan became a liberal activist and later married and moved to the suburbs to raise a family. A working mother, Friedan wrote freelance articles for women's magazines, extolling the typical 1950s family. To mark the 15th reunion of her fellow Smith graduates, Friedan conducted a survey of their attitudes and accomplishments. Some 200 of her classmates responded. BETTY FRIEDAN (Author, The Feminine Mystique): The questionnaire was quite interesting, and it raised more questions than it answered. But it showed that with all the education, American women were frustrated in just the role of housewife, but they also managed to enlarge it. BEN WATTENBERG: The survey, along with Friedan's interviews of suburban women, eventually became the basis for her book, "The Feminine Mystique." Friedan criticized how she felt society discouraged women from making careers away from home and family. Friedan called suburban homes "comfortable concentration camps." BETTY FRIEDAN (From The Feminine Mystique): It is urgent to understand how the very condition of being a housewife can create a sense of emptiness, non-existence, nothingness in women. For women of ability in America today, I am convinced there is something about the housewife state that is dangerous. BEN WATTENBERG: Although there has been some criticism of what Friedan's survey actually found, her critique struck a chord. "The Feminine Mystique" sold nearly 3 million copies in its first three years in print. Its publication is often regarded as the beginning of the modern women's movement. WILLIAM CHAFE (Duke University): When this book comes, it comes at exactly the right moment to, in some ways, start a grass fire across suburban America in which women say, "I recognize myself there. I'm one of those people who's not that happy." BETTY FRIEDAN: The first step in the revolution is consciousness. And I did the consciousness with "The Feminist Mystique." BEN WATTENBERG: Let's take a look at the lay of the land before and after the modern women's movement. The role of women had been changing quite dramatically throughout the century. But after the new round of activism that began in the mid-1960s, many of those trends continued, and some went into overdrive. The percentage of women on college campuses, though lower than that for men, had been increasing from 1900 to 1940. World War II temporarily halted this progress, but by 1965 the trend resumed its rise. By the 1980s, more women than men were earning college degrees. And what was happening to these better-educated women? Most went into the workplace. The percentage of married women in the labor force had been steadily increasing for the entire century. After the turbulence of World War II subsided, that rate kept on soaring, reaching 36 percent in 1965 and 61 percent in 1998, although many women worked part-time. The proportion of professional women has skyrocketed -- doctors, lawyers, engineers up big. Earnings for women working full-time year-round, as compared to men, took off around 1980, climbing from about 60 percent to almost 75 percent in 1997. When gender and wages are further corrected for work experience, education and time on job, the earnings gap shrinks far further, very close to equality. In 1960, almost 70 years after Frederick Jackson Turner noted the closing of the old frontier, President John F. Kennedy sounded the trumpet for a new frontier. Things seemed fine. The post-war American economy was growing strong and steady. The old pattern of boom and bust had softened. But things were about to change. Murphy's Law was in the saddle: If it can go wrong it will go wrong, at the worst possible time. Soon Americans faced grave problems -- cultural, social and economic. Growth of the gross domestic product is one measure of America's economic health. And during the first half of the 20th century, it had swung wildly, indicating a painful pattern of economic boom and bust. From mid-century on, that line would stabilize at positive levels. But in the early 1960s, clearly not everyone was sharing in the good times. A young writer named Michael Harrington challenged the notion of post-war affluence. In his 1962 book, "The Other America," Harrington estimated, and perhaps overestimated, that 25 percent of the country, between 40 million and 50 million people, lived in poverty, invisible to their more prosperous fellow citizens. The book influenced what came to be called the War on Poverty. 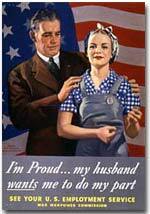 WWII poster "I'm proud..." Courtesy of the Library of Congress.